Augmented Reality apps like Metaio‘s Junaio have opened the door to plenty of innovative marketing and media experiments. What happens after the novelty wears off, though? I met up with the German company’s Jan Schlink at Mobile World Congress today to take a look at a truly useful application of the technology. As you’ll see in the video below, Metaio’s demo shows how augmented reality can be used to recognise objects and give users instructions on how to repair them. In the example here, holding your phone in front of a printer overlays an easy to follow, 3D guide on how to change its toner cartridges. While it’s just a demo for now, it’s easy to see how the technology could be applied to common, but potentially confusing, tasks like changing the oil in a car engine. 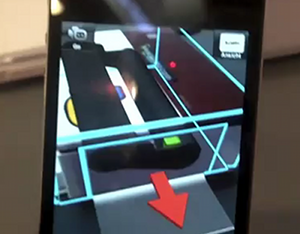 Indeed, this use for Augmented Reality was developed for use in the automotive industry, with Metaio choosing the printer example to show how it could be transferred to consumers. Metaio also has a prototype of new technology from ST Ericsson on its stand. The U8500 chipset boosts the framerate for Augmented Reality apps noticeably, making graphics overlaid onto real-life scenes appear much more ‘natural’ than they have done previously. We take a look at a demo of the U8500’s performance in the video below. The dual-core chipset is believed to be making its way into a number handsets from various manufacturers later this year. While Augmented Reality may soon lose its trendy caché, it still offers plenty of potential to be excited about. Read next: Give Star Trek Animated Gifts on Facebook with The Gift App.